With their unique structures and breathtaking colors, coral reefs are one of the world’s most inspiring and appreciated natural wonders. They’re also greatly threatened by environmental stressors associated with climate change, including sea temperature rise and ocean acidification. Some coral species are less sensitive to these climate shifts than others, and scientists have been trying to pinpoint the causes of their resilience in hopes of better managing reefs in the future. Naturally, most research in this field is happening in coastal regions. But Andrea Grottoli, professor in the School of Earth Sciences, is conducting some of the world’s leading research on coral resilience — right here in Ohio. The tank system at Reef System Coral Farm in New Albany, Ohio, where Ohio State researchers test corals' response to changing water conditions. Traditionally, scientists have examined the relationship between corals and their symbiotic algae (which gives them their color, as well as provides them with vital sources of energy) when studying resilience. When under heat stress, corals may eject some of these algae, making them appear pale or “bleached.” If normal sea temperatures return, they can re-acquire algae, but prolonged stress leads to mortality, Grottoli said. But there is likely another health component at play. Along with algae, corals also comprise intricate communities of unique and underexplored microbial organisms, collectively known as the microbiome. Grottoli’s most recent study is the first to explore what role the coral microbiome plays in anatomical resilience under the combined effects of elevated temperature and acidity. A coral’s microbiome is thought to be a part of the immune system, just like it is in humans,” Grottoli said. For 24 days, she and her team exposed two species of coral to increased seawater temperature and acidification — modeling the Intergovernmental Panel on Climate Change’s predictions for conditions expected by the end of the century — and analyzed changes in the coral’s microbiomes. They purposely chose one species known to be sensitive to temperature changes — Acropora millepora (staghorn coral) — and one species known to be resilient — Turbinaria reniformis (yellow scroll coral). They found that under experimental conditions (roughly 84.2 degrees F and 750 micro-atmospheres), the staghorn coral’s microbial community decreased in diversity and increased its population of harmful pathogens, while the yellow scroll coral’s microbiome remained stable. And while half of the staghorn corals began to bleach and show declines in physical performance, the yellow scroll coral had virtually no changes in health. Left column: Staghorn coral (top) and yellow scroll coral (bottom) after exposure to current oceanic conditions. 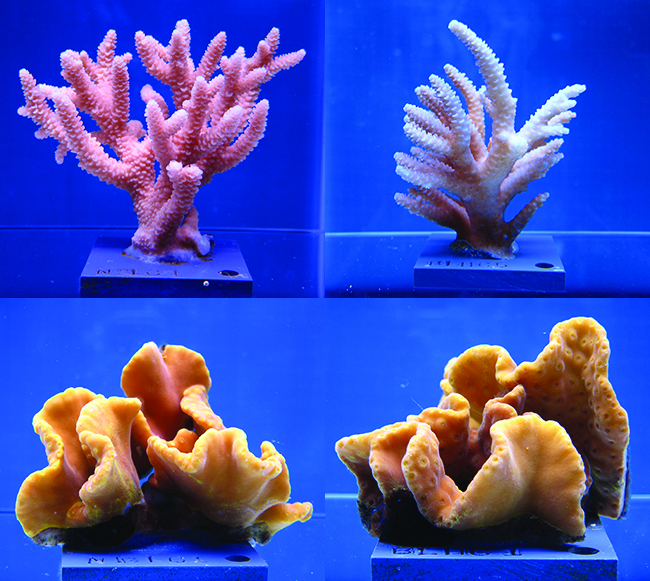 Right column: Staghorn and yellow scroll coral after exposure to higher temperatures and acidification. Better understanding this relationship will be useful in combating and preventing coral disease, said Michael Wilkins, assistant professor of earth sciences and microbiology and a co-author of the study. And with further research underway — including an expanded version of this experiment that Grottoli is working on in Hawaii — scientists are narrowing in on what makes a coral resilient. And losing coral reefs to climate change affects quite a few parties. Coral reefs host up to one-third of all marine species. Their massive structures dissipate wave energy, protecting shorelines from storms. Their presence supplies income to developing countries through tourism, scuba diving and fishing. This work was also featured in a university news release. Other co-authors at Ohio State include doctoral student Paula Dalcin Martins; former doctoral students Stephen Levas and Verena Schoepf; and former Wilkins lab manager Michael Johnston. From the University of Delaware, collaborators included Wei-Jun Cai and Tye Pettay. Co-author Todd Melman owns Reef Systems Coral Farm in New Albany, Ohio, where the experiment took place. Images courtesy The Ohio State University. Did Ohio State really detect an alien signal?